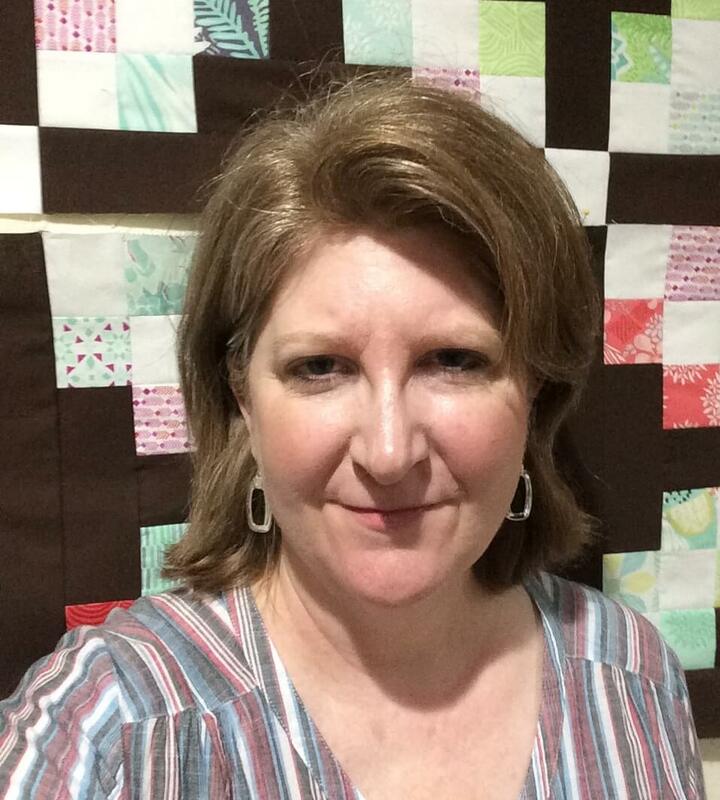 Some of the most stunning quilt designs I have seen are achieved with paper-piecing (also known as foundation piecing.) I have a whole Pinterest Board section dedicated to paper-pieced quilts. If you’d like to see some really intricate, jaw-dropping quilts, check it out. 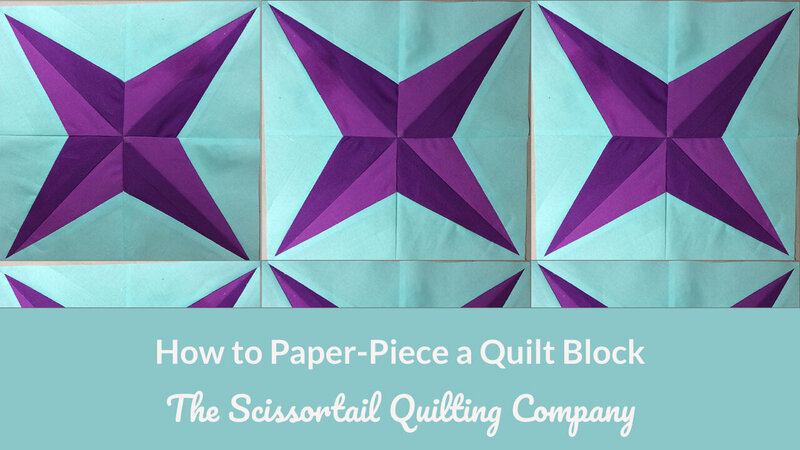 In today’s post, I’m going to explain how to paper-piece a quilt block. 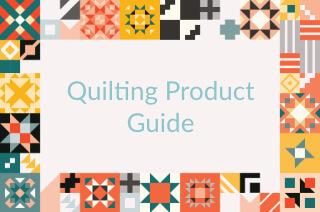 It’s the perfect technique to achieve incredible accuracy in your quilts. 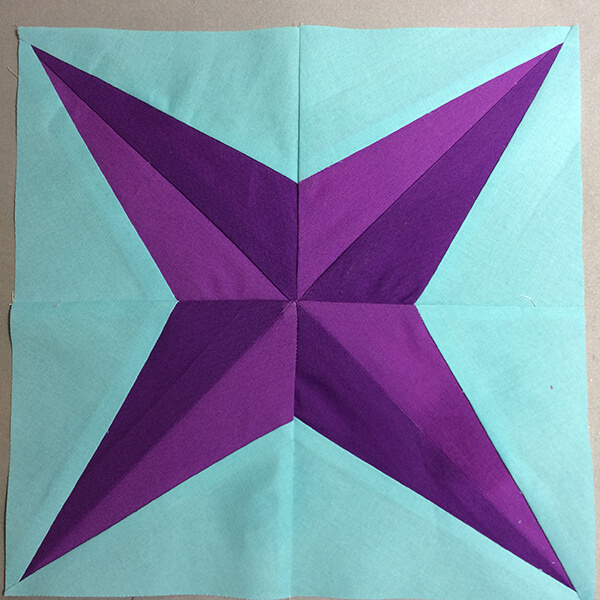 Even if you never plan to make an intricate Feathered Star quilt, knowing how to do a little paper-piecing is a good skill to have in your toolbox. So, first let’s define paper-piecing. I like to call it “Sewing on the line.” In a nutshell, it’s where the fabrics are stitched down on a piece of paper where the design has been drawn or printed. You line the fabrics up on the back of the template, and (like I said) you sew on the line! And because you stitch exactly on the line of the design the technique tends to be incredibly precise even for those with little patchwork experience. Having said that, there is still room for error if you haven’t yet gotten the knack of sewing a very straight seam. You will also need to be careful to sew EXACTLY on and EXACTLY up to the lines in the design. Convinced this is for you? If you want precision piecing, then you need to learn how to paper-piece a quilt block. It’s definitely the way to go. But I should warn you that there are a few downsides. The first is that paper piecing is going to waste some fabric. Due to the very nature of the technique, pieces will need to be cut much larger than you might think, and then the excess is trimmed away. Also, paper piecing is a bit slower, especially when you are starting out. Once you get your head around it, it will go faster and you will find ways to chain piece sections so that you can speed up the process. But you won’t ever be able to get around the fact that after each seam, you will need to fold the paper, trim the seam, then press it open. Yet even if all of it is a bit time consuming, the results don’t lie: it’s precise! Another tricky part of paper-piecing is that it’s easy to get things turned around because your fabrics are on the underside of your templates, and actually, the templates are reverse (mirror) images of the finished unit. I actually forgot about this when I made the test block for this pattern. So, you have to get your head around this when it comes to where you place your fabrics. You’ll see what I mean when you get to the end of this post. Let’s learn how to paper-piece! Let’s get started with a very simple block. 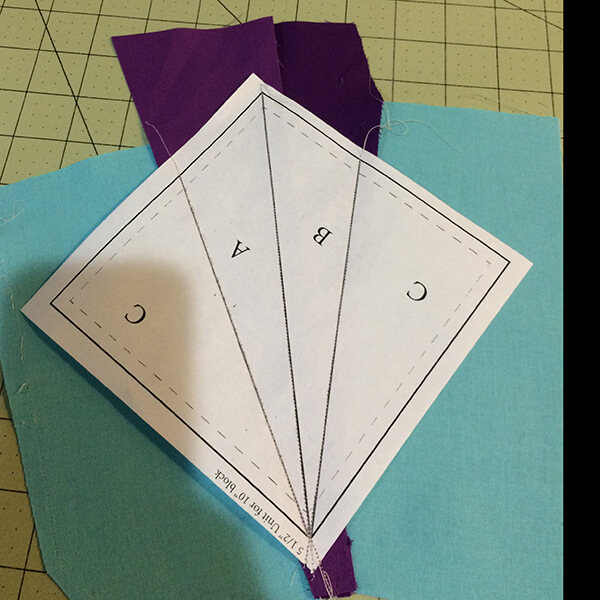 For this tutorial, we are going to learn how to paper-piece the Job’s Trouble Quilt Block. Hop over to that page in the library and grab the free template download and we will get started. With most paper-pieced blocks you will start off by creating your foundation papers. You will need access to either a copier or tracing paper. Print the template four times as directed in the download, then trim around the heavy black line. Do not trim on the red dashed line, which indicates your seam allowances. Templates and Fabrics are ready to go. 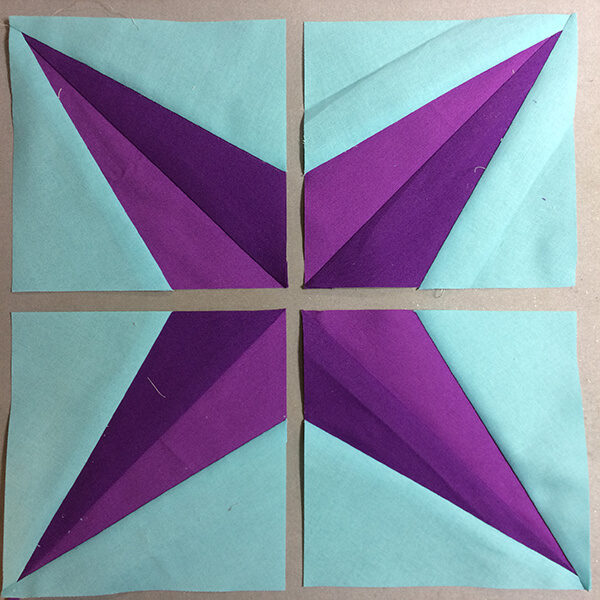 Let’s learn how to paper-piece a quilt block! Set your sewing machine stitch length to a slightly tighter stitch length than you would normally use when sewing, such as 1.5 mm. 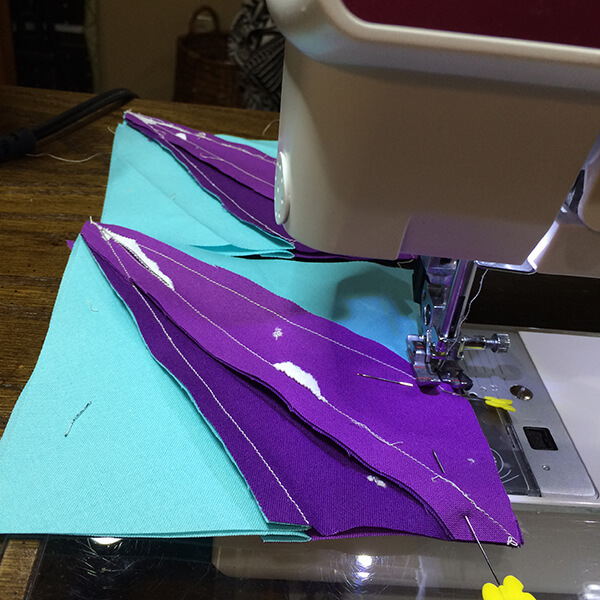 It’s important to note that you will be sewing through two or more fabrics plus the paper. This tighter stitch length will perforate the paper so that it can be easily removed, but it also serves to help the stitches not come undone when you remove the paper. On the UNPRINTED side of your template, position piece A so that it entirely covers the area for piece A on the template with the right side facing out. It is helpful to hold the paper up to a light source to see if you are positioning it correctly. 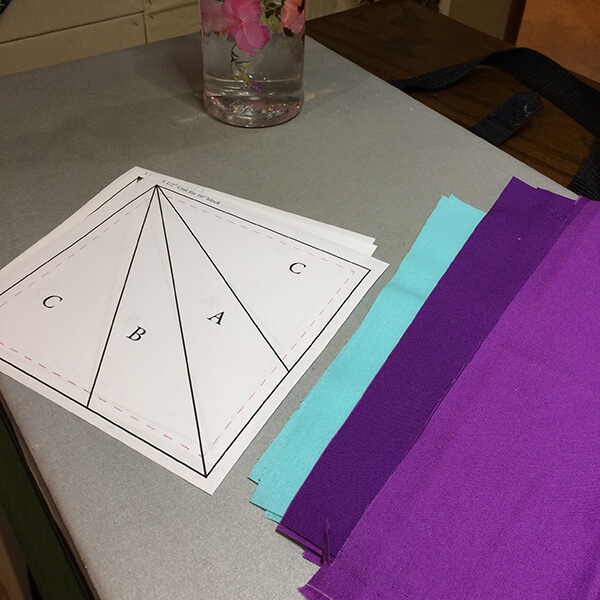 Take care to make sure the at least 1/4” of the fabric is over the center diagonal line on the template. Another thing to watch for is to make sure each block is done exactly the same way. Now position piece B right sides together with piece A and pin in place. Take template to the sewing machine with fabric on the bottom and the printed side of the template face up. 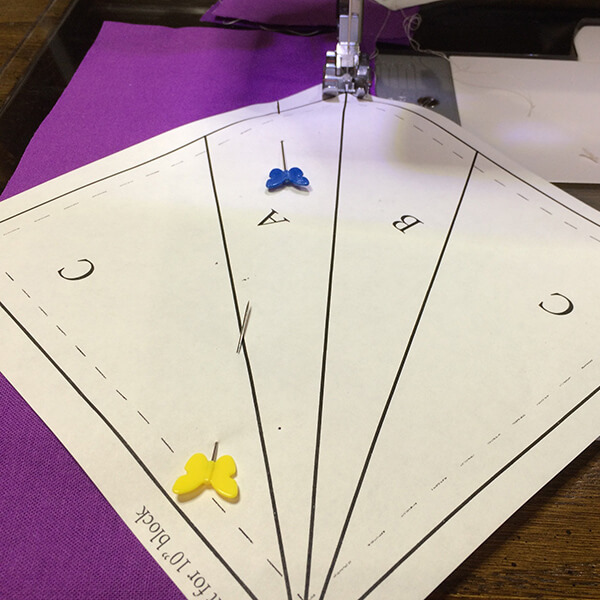 Sew on the center line between pieces A and B, making sure you sew past the red 1/4” seam allowance line. Press open. Next take a C piece and place it right sides together to the A piece, aligning it so that 1/4” of the C piece passes over the line on the template between pieces A and C. Pin in place and sew on the line, again with the printed side of the template face up and the fabric underneath the template. 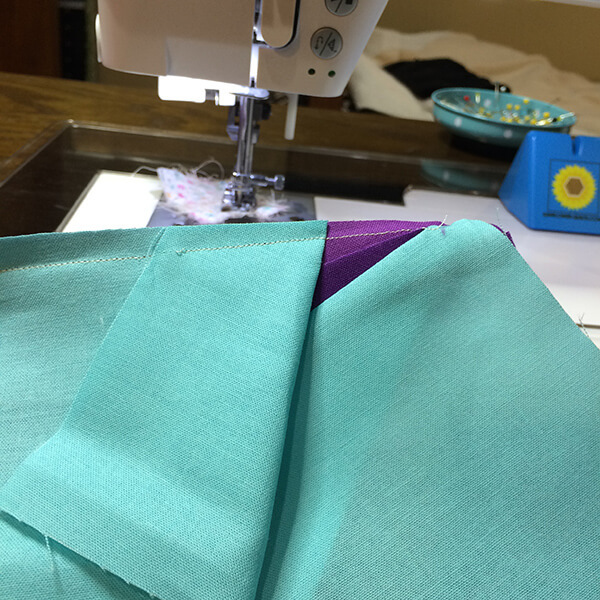 Trim any excess seam allowance down to 1/4” if necessary. Open and press. Repeat this step on the other side of the template using the remaining piece C.
Repeat steps 4-6 for your remaining 3 template papers. Trim each template to measure exactly 5.5”, making sure to not trim off the seam allowance. 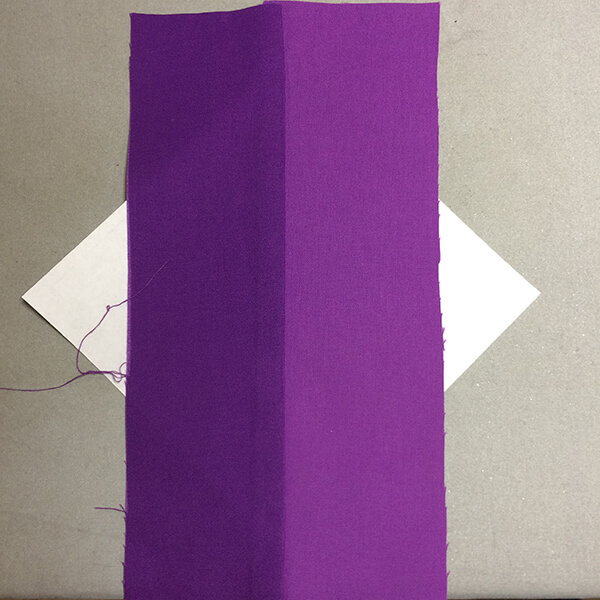 Properly Trimmed Template – Note the corner with a 1/4″ seam allowance. Now we can sew these four template pieces together as a 4-patch block. After I made my block I realized that I got the lights and darks. A little investigation resulted in me realizing that I had them marked wrong in the pattern. Fixed now, though. You may notice that I took the papers out before sewing the templates together because I get tired of the bulk. You can remove your papers either at the end of step 7 or 8. I’m told that some people just leave their papers in the quilt, to be absorbed into the batting over time as the quilt is washed and used. But for me, I’d prefer to take them out. Well, I hope you enjoyed learning how to paper-piece a quilt block. 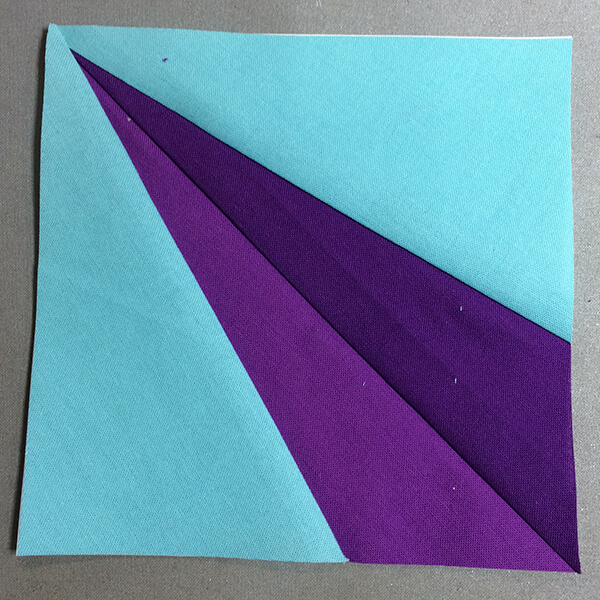 If you enjoyed making this block, you might enjoy making some other paper-pieced blocks, such as the Hosanna Block. Even though I got the colors reversed, I’m happy with my block, and can’t wait to put it into my Heart Sampler!